As I wrote the last section of my first chapter, I discovered that a few of the sources I was relying on to tell the story of the the 1946-47 Jewish Welfare Board Survey (AKA the Janowsky Survey, after its director) were quite tricky to analyze. Because I could not find minutes or records of several important meetings, I had to piece together the proceedings from summaries that were written later--sometimes weeks or months later. How, I wondered, had hindsight colored these descriptions? Could I trust that this was what actually happened? All historical sources have their challenges. Sometimes it's a problem of omission: the authorship of a document is unclear, or materials are undated, or the subject is ambiguous. Sometimes it's a relational issue: where does this document fit into a broader context or story? Or, why does this document contradict other sources? Then, of course, there's the ever-present challenge of reading between the lines of every document for the silences and assumptions and things left unsaid. Depending on the extent of the issue or the relevance of the document, these challenges can be addressed. Dates and authors can be guessed at using context clues and comparisons to other dated/attributed sources. Ambiguity and contradictions can be mitigated by volume; consult enough sources and a clear picture might eventually emerge. The same could be said for records you suspect were influenced by hindsight--my problem, however, was that I did not have the necessary volume of comparable sources to balance out my interpretation. To get specific, this section was about the controversies that erupted after the Survey Director, Dr. Oscar Janowsky, advocated that Centers should be sectarian and that Jewish content should be "primary" in all Center activities. Over several pages, I outlined the various iterations of the Statement of Purpose that the JWB proposed based on Janowsky's survey. I highlighted the changes that were made as a result of opposition by, first, Jewish Center workers (represented by the National Association for Jewish Center Workers, or NAJCW) and, second, by a group of JWB lay leaders who hired Louis Wirth to conduct an "Independent Survey" of Janowsky's Survey in order to critique his emphasis on Jewish content. The changes to the Statement of Purpose were made in a series of meetings in 1947 and 1948, but despite my best efforts I could not find meeting minutes from most of them. Luckily, at the JWB's Annual Meeting in Chicago in 1948 the changes were discussed in great detail--and there was a stenographer who made a transcript of the entire proceeding! I was able to work backwards and determine how the final Statement of Purpose evolved from meeting to meeting. Unfortunately, what I lost in this process was any sense of individual agency. I was able to see changes agreed upon by the acting committee, but not who dissented and why. I also had to assume that the rationales for the various changes given at the Annual Meeting were actually the arguments made in those earlier meetings, and not rationales that appeared more palatable in hindsight. That's an important distinction to make when you're examining a controversy! I also consulted a reflection written by Janowsky in the 1970s. While his memory of the events plugged a lot of holes in my accounting of the events, I struggled to trust his assessments of why things happened the way they did. Not only did I fear that the passage of time might have affected Janowsky's recollections, much of the controversy manifested as personal attacks against his politics and his scholarly authority. He certainly could not be blamed for remembering the events as being much more inflammatory or polarizing than they actually were, or for pinning responsibility on certain individuals that were especially unkind towards him in 1948. In the end, I relied on these documents to illuminate process and analyzed correspondence and other contemporary sources (reports, the meeting minutes that I did manage to find, etc.) to come to my own understanding of why certain changes were made. I think I made good choices about what information was "safe" to accept at face value and what was tinted by hindsight or agenda. I found myself really wishing, however, that I had a second reader to give their opinion. Up until this point in my educational journey, I've always read along with others--in courses and seminars, you learn as much from your colleagues' interpretations as from your own. This was the first time that I had to make an assessment all by myself, as the foremost expert on the topic. It's the scholarly version of becoming a grown up. As exciting as it is to be given responsibilities and independence, it takes a while to find your confidence and to stop calling your parents every ten minutes for their advice. In yesterday's post, I emphasized that notes are most effective when they focus on details that support your argument or that help you tell a particular story. That raises the question, however, of how do you know when a document will contribute to your study? Sometimes you go into a project already knowing what events, themes, or arguments you plan to make. Other times you go in thinking that you will write about one of thing, but then the sources lead you to make a completely different point. It's also possible to just begin reading sources without a particular intention. You just hope that the sources will inspire a question or present an interesting story for you to tell. During my first foray into archival research, I thought absolutely every word that I read was relevant and compelling, that each source presented a simple, uncomplicated truth. I couldn't see the forest for the trees. That became problematic when I began writing my paper. There was no clear place to start, and when I went back to look at my notes it seemed that every conflict, every policy, every decision was equally as important. After many hours of paralysis, I stepped back and re-read some of the sources I remembered most clearly. I figured those were the ones I must have found to be especially engaging. The story that jumped out at me ran through a set of document from the YM-YWHA of Washington Heights, in which a building fund campaign committee described how difficult it was to raise money for the construction of a new home for the Y. My question became, "Why did such a such a desirable and necessary neighborhood institution struggle to raise funds for this badly-needed capital project?" I was then able to reanalyze the documents I had collected and to clearly identify which records helped me answer this question, and which records were tangential. Some of them provided context but did not support my argument. I was glad to have those, but I certainly did not need copious notes on each of them! 1. Does this document (or set of documents) tell about an event from start to finish? Does it/they provide all of the information I need to describe what happened? 2. Is the event, controversy, or debate described in this document related to other events/controversies/debates that I plan to study in my research project? 3. Does this document help me answer a question I am interested in? 4. Could I find other sources that I could use to "cross-examine" this document? Do I have any way to check if the event(s) described happened that way, or if the event(s) were interpreted another way by other people? [You need to have other evidence that support your documents, just like a lawyer needs evidence to support the testimony of a witness]. 5. Is this source trustworthy? Who wrote it and with what intention? If I answer yes to these questions, the document is a keeper. I let myself take notes freely, with gusto and verve. If I answer no to the first three, but think that it's a source that will help provide context--for example, to show how an organization worked, or what a particular individual was like, or to describe the physical surroundings of a place--then I would consider the document necessary but would try not to spend more than a few minutes taking notes. These sorts of documents are useful at the writing stage, when you need to fill in the details. They can also be useful for cross examining your most important documents, because they can corroborate small details that support the veracity of your interpretation. If I answer no to all of these questions, I force myself to put the document back in the folder from which it came. I may be dying to read it, to see if there's some juicy story buried inside. I constantly have to remind myself that there are many good stories buried in the past, but I can only tell a few of them in my dissertation... and those few stories all have to make sense together. I used this same process to choose case studies for my dissertation. I surveyed urban Jewish Community Centers across the U.S. and quickly decided whether the experience of each Center could help me answer one of my questions about postwar urban JCCs. I also asked: Does an event, controversy, or debate experienced by this organization represent a larger historical trend in American (or American Jewish) history? I had already studied the YM-YWHA of Washington Heights and wanted to include it as a case study in the dissertation, so I decided that I would narrow my focus to other Centers that experienced a Jewish to Latino demographic transition during the 1960s and 1970s. That's how I chose JCCs in Los Angeles and Miami as my other case studies. To be honest, I'm still not entirely sure if I've done a good job selecting case studies. I may decide to reevaluate as I continue the research, because the more I learn the more unsure I am that Los Angeles and Miami can help me represent a larger historical trend in American Jewish history. That's how it goes, though. As my advisor says, writing a dissertation is not fulfilling a contract. You're allowed to wing it a little! There's always contingency in research, and you can only have fun with it if you learn to accommodate and enjoy the surprises. My mother has no idea what I do all day. Back when I was in coursework she understood that I read books, went to class, talked about the books, and then wrote papers about the books. When I was preparing for my comprehensive exams she understood that I read all day and then took notes on what I read, and six months later she could relate to taking a really hard test. 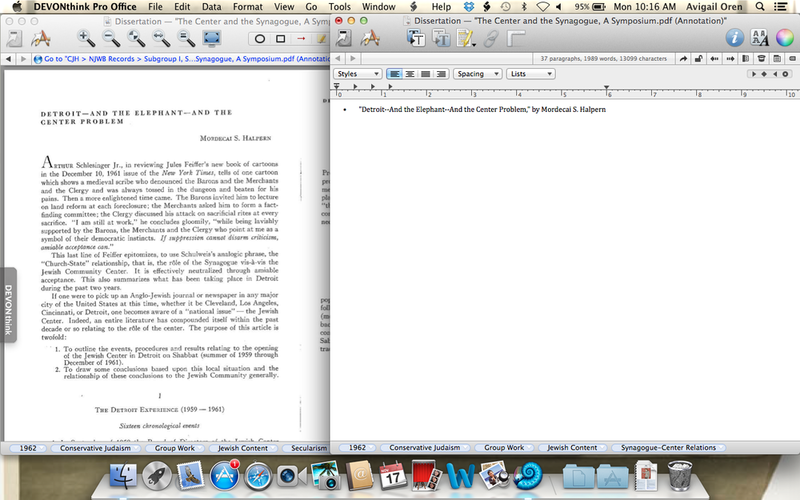 Now that I am working on the dissertation, though, it's less familiar. I've described the archives to her and, since my dad wrote a dissertation many years ago (which she typed), she knows that I'll be spending two years putting my deep thoughts into words. It's how I get to those deep thoughts that is less clear to her. And she is not alone. I think most people are under the impression that historians primarily spend their time writing, but I reckon it's about a 50/50 split between research and writing (though this might vary from scholar to scholar). The most mentally intensive part of research is reading and taking notes on documents, and it's also the least visible part of the process of writing history. Everyone has their own style of note taking and does it a little differently, but there are a few fundamental points that a historian always tries to capture. To demonstrate, I will walk through some notes I took yesterday on the document displayed in the slideshow above. You can use "next" arrow or click on the thumbnail tiles at the bottom to follow along. This article by Rabbi Mordecai S. Halpern, "Detroit--And the Elephant--And the Center Problem," was published in a special issue of the journal Conservative Judaism [screenshot 1]. "The Center and the Synagogue: A Symposium" was published in 1962 and featured articles by prominent American rabbis criticizing Jewish Community Centers. I found a copy of this special issue of Conservative Judaism in the records of the National Jewish Welfare Board at the Center for Jewish History. Several leaders in the Jewish Center movement, including the director of the 92nd St. Y, were also solicited by the journal to respond to these arguments and mount a defense of the JCC. The "Symposium" issue resulted from a dust up the previous year, when Rabbi Harold Schulweis of Temple Beth Abraham in Oakland, California, published a critique of the JCC's emphasis on leisure time and recreation. He denounced the institution for not incorporating sufficient Jewish content into their programming and for distracting Jews away from the synagogue by offering basketball and contact bridge. 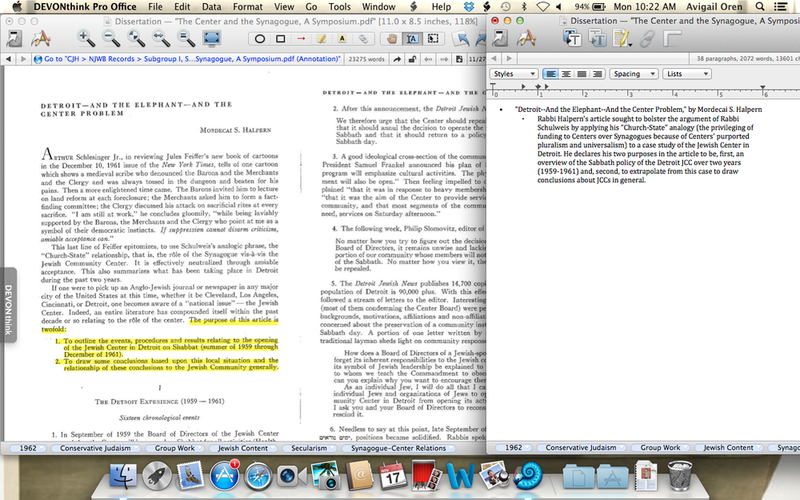 My first note, then--after the date, author, and title [screenshot 2]--was to contextualize the document [screenshot 3]. In his second paragraph, Rabbi Halpern borrowed an analogy made by Rabbi Schulweis*, so the first thing I indicated in my notes was that Rabbi Halpern's intention was to bolster the argument made earlier by his colleague. I briefly explained the analogy so that my future self can quickly grasp the meaning (and searching through the preceding document). 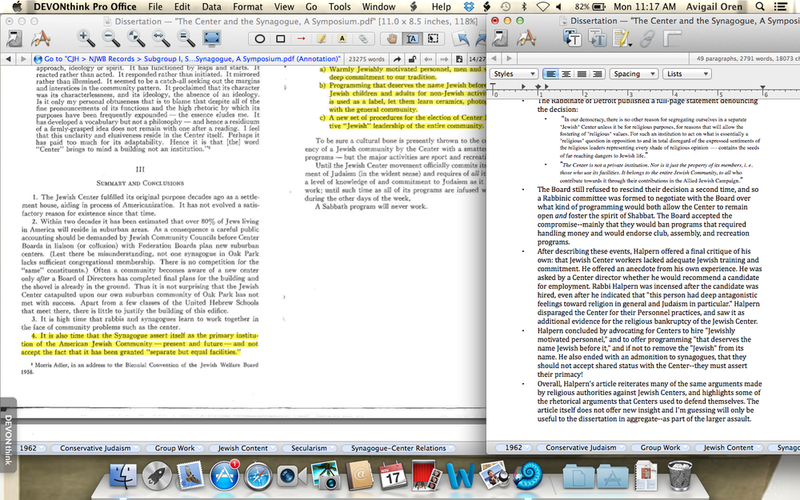 I then highlighted and summarized the two purposes of the article that Rabbi Halpern articulated. I made sure that my lead-off note would provide a brief overview of the article's argument and of its intention: to reinforce Rabbi Schulweis's critique of the Jewish Community Center as insufficiently Jewish by offering a case study of the Sabbath policy of the Jewish Center of Detroit. As I skimmed ahead, I realized that Rabbi Halpern organized his article into a chronological overview of the major events of the Sabbath policy debate between 1959 and 1961. Since my research does not deal with Detroit, I decided that it was not important for me to describe each detail of the debate. One of the Jewish Centers I am using as a case study, though, had its own battle with the rabbinate over Sabbath policy. I decided it would be useful to summarize the arguments that each side deployed against each other to justify opening or closing the Center on Saturdays [screenshot 4]. Later I can then compare the Detroit case to New York and possibly make a claim that the experience of "my" Center represents the norm for urban JCCs across the United States. Next, I summarized how the debate ended. Essentially, the Center backed away from its plan to open on Saturdays after local rabbis and laypeople protested the desecration of the Sabbath by a Jewish agency. Historians are interested in change over time, so I made sure to note that the next year the Detroit Center again declared their intention to open on Shabbat [screenshot 5]. This time, they stood up to the rabbinate. Budgetary pressure provided them with leverage against their opponents. A major grantee withdrew financial support, leaving the Center to decide if they should cut their cultural program (drama and music) or increase their revenue by opening on Saturday. Even the rabbinate disapproved of cutting all of the cultural programs, and "negotiated" that the Center's Saturday programming would reflect the spirit of Shabbat [screenshots 6, 7]. Rabbi Halpern concluded with a critique of his own. He argued that Jewish Center personnel lacked Jewish educations and that this inadequacy contributed to the insufficient Jewishness of Center programs. I noted this argument and the anecdotal evidence that Rabbi Halpern used as support [screenshot 8]. Finally, I finished my notes with an overall assessment of the document. I evaluated the relevance of the article to my dissertation--more specifically, how I plan to discuss the competition between synagogues and JCCs for limited membership and resources in postwar cities--and wrote a little reminder for my future self of how I think the article should be used [screenshot 9]. Effectively my notes are a distillation of the argument, intent and purpose, major points, and supporting evidence of a given document, paired with my evaluation of its relevance to my narrative. Most of my sources, however, are not articles. More commonly I am taking notes on organizational records: memos, letters, meeting minutes, reports, evaluations, or strategy papers. Sometimes there's no argument, only a laundry list of events or to-dos. Often, especially in memos and letters, the content is a director conveying their opinion to an employee they supervise. That leaves me with the unenviable task of interpreting the author's intent or their perspective on a topic. My point is, it's not always this explicit or clear. That's what keeps it interesting. *Rabbi Harold Schulweis published a follow-up article in this special issue of Conservative Judaism. It is this article and not the original article in The American Rabbi that Rabbi Halpern is explicitly engaging.